Enhanced shift logic seamlessly delivers the engine efforts to the pavement for smoother, more refined acceleration. Paddle shifters put that power and performance a mere finger’s length away. An undeniably powerful 420-horsepower V8* with an increased compression ratio and upgraded multiple-injection mapping propels the Genesis. The Genesis suspension is continuously hard at work enhancing precision and control for the driver, while an increase in rear lateral stiffness allows for more confident handling. 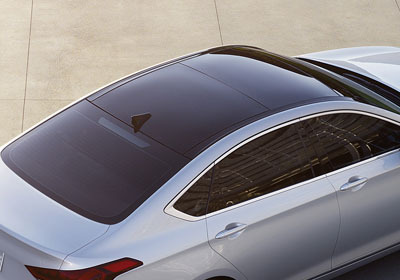 With its class-leading interior volume, the Genesis feels even more spacious with a sunroof that takes in panoramic views of the day and nighttime sky. 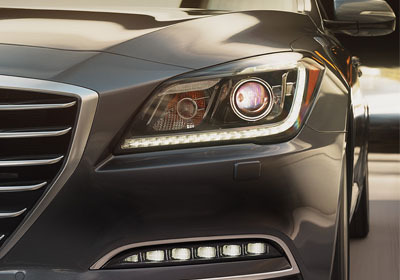 The Genesis features standard High Intensity Discharge (HID) headlights with a sophisticated auto-leveling system that keeps light parallel to the road surface regardless of vehicle load. The result is that the driver enjoys light coverage at all times. See and be seen with standard LED Daytime Running Lights, LED tail lights and available LED fog lights. In developing the Genesis, our designers and engineers pushed the wheels closer to the front and rear of the vehicle for a more athletic stance, improved stability and an even smoother ride. The Genesis allows you to find the ideal comfortable position by injecting air into the seat bolsters and power seat cushion for further leg support. Surround yourself with an available 17-speaker state-of-the-art system that produces pristine audio. This exclusive GRAMMY®-award-winning technology delivers sound via high-efficiency speakers and amplifiers. Genesis offers the latest features of Blue Link and demonstrates Hyundai’s dedication to make driving safer, easier, more convenient and more fun. Newly added features include Destination Search powered by Google™, enhanced remote access, and next-generation multimedia apps like Pandora® and Aha™ Radio. Hyundai also continues to offer Blue Link® Connected Care for a 1-year complimentary period (enrollment required). The center console is highlighted by an available HD touchscreen with Intel Inside®. With this technology and computing power, Genesis offers impressive in-vehicle screen resolution compared to other vehicles in the midsize luxury class. You’ll enjoy immediate response to your touchscreen inputs and seamless transitions between screens without any lag. This superb display measures 9.2 inches, and comes complete with a Driver Information System capable of serving up everything from Bluetooth® streaming audio to Gracenote® Album Art. 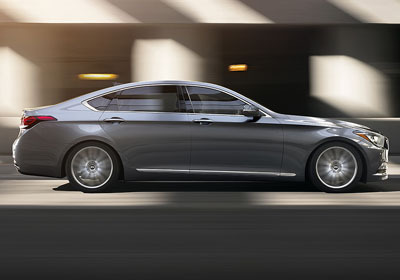 The Genesis features an Automatic Emergency Braking* system that uses both a camera and a radar sensor. If a crash is imminent and the driver does not react, the system deploys Automatic Emergency Braking. The system can even apply full brake-force stopping power from 5 to 50 mph, giving you an added element of safety. To increase awareness on the road, the Genesis employs a radar system that may detect when a vehicle is in the driver’s blind spot or in the rear cross path while backing up. If an object is detected, the system then provides both an audio and a visual alert. The Genesis serves up all the relevant information in the driver’s line of sight. Speed, navigation, Lane Departure Warning and Blind Spot Detection, all in one place. An available 7-inch color instrument panel display also helps keep the driver well informed without much effort.